Pittsburgh and southwestern Pennsylvania Pumpkin Patches, Corn Mazes, Hayrides and More - Find Halloween and Fall Fun! Looking for a local pumpkin patch, corn maze, hayride, gourds and other Halloween activities in Pittsburgh and southwestern Pennsylvania? Scroll down this page and you will see the all of those in Pittsburgh and southwestern Pennsylvania, sorted by county. Some are farms, where you take a hay ride out into the field, others are elaborate farm stands with mountains of pumpkins and other activities and some are simple roadside stands. Most have loads of pumpkins to choose from. To really make it fun for your kids, look for those that have the extra activities, like a corn maze, spook house, or hayride. There is usually a small fee for the mazes (of course, the more elaborate mazes tend to charge more. Hayrides are often free. ALWAYS call before you go to confirm the info, they don't always report changes to me! A visitors says on October 13, 2008: "price of pumpkins is .40 per pound" "
36 Starr Road, Cheswick, PA 15024. Phone: 724-265-3073. Email: kathyjopaskorz@yahoo.com. Directions: 20 miles north of Pittsburgh on route 28, on orange belt in west deer twp. And for a map to our farm, click here. Crops are usually available in June, July, August, September, October, November, December. Open: Monday to Friday, 8am to 8pm, Saturday to Sunday, 12pm to 5 pm. strawberries June 1 to June 22, blueberries: June 20 to August 30, black raspberries: June 20 to July 04, red raspberries: July 1 to July 20, blackberries: August 1 to August 30, pumpkins & cornstalk: September 15 to October 31. Payment: Cash, Check. A visitor writes on May 20, 2016: "Reilly's Summer Seat Farm closed its doors permanently last Fall. Just wanted to update your list!See this for more information: Best-of-the-Burgh-Blogs/The-412/October-2015/Reillys-Garden-Center-at-Summer-Seat-Farm-Closing-Nov-13/"
2573 Brandt School Rd, Wexford, PA, 15237. Phone: 724-935-1743. Email us at: applepie1@earthlink.net. Soergels is open year round. There is a market, bakery, deli, garden center, farm animals, mining sluice. Nearly one weekend each month there is a festival or special event. On Sundays in August there are Corn Roasts, October brings harvest festivals each weekend with hayrides, pony rides, horse drawn wagon rides, straw tunnel, moonwalk, duck pond, loads of festival food and more..
5169 Lakeview Dr, Gibsonia, PA 15044. Phone: 724-443-5532. Directions: *Just 20 minutes from Cranberry Township *Only 20 minutes from I-79 *5 minutes from North Park And for a map to our farm, click here. Crops are usually available in October, December. Open: October- 10-4pm 2nd-3rd WEEKENDS ONLY! Pumpkins...Pumpkins... MORE Pumkins! Pumkin Patch- Available the 2nd-3rd weekend only in October. All homeschool families receive a 10% discount, must mention that your family homeschools. Payment: Cash, only. 528 Trax Road Finleyville, PA, 15332. Phone: 412-835-3246. Open: Hours and directions. Activities: Entire Month of October - Fall Harvest Festival Share the harvest season with us! During the month of October, enjoy the sights, scents and sounds of fall with our cornstalk maze, play area for children, and fall decorations created right here at the farm. Come and climb over piles of pumpkins at the market or take the family out to the fields and wander through acres of pumpkins. On weekends in October we will have a wonderful harvest of food to eat, Kettle Korn, Rainbow Express train ride, Pony Rides, Hay Rides, Cornfield Maze, Petting Zoo, and much more. Saturday 29 - Customer Halloween Party Enjoy a safe and warm evening at Trax Farms. Come in your favorite costume and trick or treat through our many departments. The garden cafe will be open selling refreshments. There will be hayrides available too! November: Friday, Saturday & Sunday 11, 12 & 13 - Christmas Open House - Visit our Christmas Shop filled with decorated theme trees and many holiday decorating ideas. The Deli & Bakery will have samplings of homemade cookies, meats & cheeses, breads, dips, homemade cheeseball and much more! Come and make a cookie house for the holiday (fee charged). Special holiday savings during the Christmas Open House. Saturday & Sunday 19 & 20 - Holiday Cooking Demo Don't know how to stuff and roast a turkey? come and learn how to prepare a turkey and the different Thanksgiving dishes like, sweet potato casserole, fresh cranberry relish and homemade pumpkin pie. Saturday 26 - Light Up Night come help us start off the Christmas season! Browse through our many Christmas displays. There will be many Christmas activities for the whole family. A visitor writes on October 08, 2012: "regarding Trax farms on western PA pumpkin patches and more website: VERY EXPENSIVE!! Lots of activities, but you pay for everything. $8 per adult hayride, $6 per child hayride, $6 for climbing wall, $5 for child tattoo, $4 for pony ride, and the list goes on and on. Plan to spend a lot. Also, no atm and cash back only with $50 purchase at market." NOTE from a visitor (October 2, 2006): "Trax Farms is charging $8 per person just to ride their tractor to the pumpkin patch. That does not include the pumpkin! And, everything else in their festival is "ala carte". They charge a family of six $52 just to enter their pumpkin patch, and they do not allow you to walk or drive to the patch yourself. " 823 Berry Lane, Monongahela, PA 15063. Phone: 724-258-3557. Fax: 724-258-7899. Email: info@triplebfarms.com. Open: Strawberry Season (approximately Memorial Day, call first) thru October 31st, Halloween Monday to Friday 10am to 6pm Saturday and Sunday 10am to 5pm. Click here for current open hours, days and dates. Picking updates: Click here for updates. Directions: Click here for a map and directions. Strawberries: end of May to mid-June Raspberries: end of June to mid-July Peaches: August Blackberries: August Apples: September and October Pumpkins: end of September to October. Payment: Cash, Debit cards, Visa/MasterCard, Discover, WIC Vouchers. Click here for our Facebook page. 314 Ford City Road, Freeport, PA 16229. Phone: 724-295-3950. Open: Saturday and Sunday October 3 pm to 4, 10 am to 11, 17 am to 18, 24 pm to 25 from 11 am to 6pm. Directions: From PA-28 take Exit 16 Millerstown/Freeport Take Bakerstown Road (past BP) to Freeport Road. Turn Left at Freeport Road; at the Y stay right continue on to Second Street. Turn Left at High Street/PA-128; continue through Freeport on PA-128 (about 2 miles). Turn Right at Ford City Road. Farm is about 3 miles on Ford City Road on the Right. Click here for a map and directions. Payment: Cash, only. Pumpkin Fest is held Saturdays and Sundays in October! Come and enjoy family activities including hayrides, face painting, story telling and more! Pick out pumpkins, corn stalks, and delicious treats. 250 Tyro Road, Baden, PA 15005. Phone: 724 869 3491. Email: chalupiakfarm@yahoo.com. Open: third weekend of September thru October 31st, Daily 9am to 6pm. Directions: Route 989 South(Ridge Road Ext.) Make a left onto Tyro Road, There will be signs for pumpkins at the end of the road. Go 1/4 mile back the road, farm will be to the right. Click here for a map and directions. Payment: Cash, only. 226 Cheeseman Rd, Portesville, PA 16051. Phone: 724-368-3233. Email: Betsy@cheesemanfarm.com. And for a map to our farm, click here. Crops are usually available in September, October. Open: Call or check the web site for times of operation. Haunted Hayride and Pumpkins from Mid September throughout October; Thursdays-Sundays; Check the web site for details. Payment: Cash, only. 328 Hoon Road, Butler, PA 16001. Phone: 724-822-8852. Email: forallfamilyfarms@yahoo.com. Open: Pumpkin Patch Saturday and Sunday, from 11am to 6pm, September 29 thru October 28; Haunted Trail Friday and Saturday 7:30pm 10:30pm, October 12 to October 27. Click here for current open hours, days and dates. Directions: Click here for a map and directions. Payment: Cash, Check, Debit cards, Visa/MasterCard, Discover. Click here for our Facebook page. 1429 three Degree Rd., Valencia, PA 16059. Email: nbchez@connecttime.net. Directions: see website And for a map to our farm, click here. Crops are usually available in October. Open: Saturday and Sunday only 11am-6pm Payment: Cash, only. Harvest Valley Farms - Pick-your-own pumpkin, hayrides, crafts, farm animals, face painting, corn maze, straw maze, hay maze and live entertainment. 125 Ida Lane, Valencia, PA 16059. Phone: (724) 443-5869. Email: kings5@consolidated.net. Most activities are on Saturdays and Sundays during October. There is no admission fee. Open: Pick-your-own-pumpkin Saturday and Sunday in October 10 to 5, Market Mon to Friday 10 to 6, Saturday from 9 to 6, Sun 10- 4. Season: May 5 - October 31. 1341 Nicktown Hill Rd, Nicktown, PA 15762. Phone: 814-948-5902. Email: barrridge@comcast.net. Open: Monday thru Sunday 10 am to 6 pm. Click here for current open hours, days and dates. Directions: From the West: 422 East to 553 East thru Nicktown, bear Left on to 271 North. Maze on Right. From the South: 271 North, thru Nicktown, 1 mile, Maze on Right. From Ebensburg: 219 North to 553 West to 271 North. Maze on Right. From the North: 219 South to 271 South. Maze on Left. Click here for a map and directions. Open: September 21, 2012 through October 31, 2012. Payment: Cash, only. Everyone out of the maze by 6pm.A variety of items to choose from: corn stalk bundles, 3 sizes of straw bales, indian corn, gourds, carving pumpkins, pie pumpkins, crafts, and mum's. There are also tents with loose hay for playing in and a covered area of shelled corn for the younger children to play in. Cost for the maze is $4 for adults, $3 for children ages 4 to 12 and kids 3 and younger are free. 457 Saint Augustine Road, Patton, PA 16668. Phone: 814-674-8440. Alternate Phone: 814-312-5042. Email: cmsmyer@aol.com. Open: Market and Maze open on Friday, September 17 through October 31; Market is open daylight hours every day; Maze open on Friday 5-8pm Saturday 11am-8pm Sunday 12-4pm; Cost: $4, children 3 and under are free; Last admission is 2 hours before closing; Haunted maze on October 30 and 31, beginning at dusk. Directions: From the South: Route 36 north to Saint Augustine Road, turn right, go 1 mile and maze is on the right. Located 30 minutes from Altoona. From the North: Travel 3 miles south of Patton and turn left onto Saint Augustine Road; maze is 1 mile on the right. From Glendale Lake area (10 minute drive): Take Beaver Valley Road to Saint Augustine Road; turn right on Saint Augustine and travel one mile to the farm, located on the left. Click here for a map and directions. Payment: Cash, only. Large variety of pumpkins, gourds, squash, Indian Corn, Broom Corn, straw bales, corn stalks and more. Also kids corn box. Bring your own flash lights and cameras; glow sticks are available for purchase. 517 Vale Wood Road, Loretto, PA 15940. Phone: 800-861-MILK. Fax: 814-886-9619. Email: valewood@valewoodfarms.com. Directions: From Route 22, take the Munster Exit. Straight through the blinking light and follow the signs to "Vale Wood Farms Dairy Store." And for a map to our farm, Click here. Click here for picking updates. 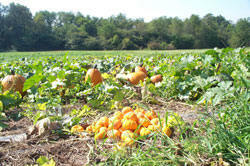 Crops are usually available in October. Open: Monday to Saturday, 9am to 5pm, Sunday noon to 5pm, with extended Summer weekend hours. Our on-farm dairy store is open year-round with ice cream, milk, and more. Our Pumpkin Patch is October weekends- please check our website for details. School tours also available. Payment: Cash, Check, Visa/MasterCard, AmEx. We're a family farm- from moo to you. We process our own milk and all-natural dairy products and market them directly to consumers. We take pride in our healthy, happy, rBST-Hormone-Free cows. 157 Creek Rd, Brownsville, PA 15417. Phone: 724-246-7601. Fax: 724-246-2601. Open: The farm market opens on June 6th, Monday-Friday 8:00 AM-6:00 PM, Saturday & Sunday 8:00 AM – 5:00 PM. Directions: Call for directions. Payment: Cash, only..
A visitor writes on August 26, 2012: "They have roadside stands but I stop at the farm about once a week for the best sweet corn and tomatoes." sararockwell@richfarms.com. Open: Thursday 2:00 pm - 6:00 pm, Friday - Sunday 10:00 am - 6:00 pm. Last entry at 4:30 pm. Do you know of any pumpkin patches, corn mazes, or other special Halloween events in this county? Please tell me about them - Click here to write to me! 155 Thomas Covered Bridge Road, Indiana, PA 15701. Phone: 724-349-3904 or 1-877-349-3904. Open: Farm Market: open daily, 9 a.m. - 5 p.m. Hayrides to Pumpkin Patch: Saturdays and Sundays in October, 12 p.m. - 4 p.m. Haunted House and Maze: Fridays, Saturdays, and Sundays in October, 6 p.m. - 11 p.m.; 6 - midnight on Halloween. Directions: See their website for directions. Payment: ..
A visitor writes on October 24, 2010: " In October there are Halloween-related activities including a corn maze, haunted house, and hayrides to the pumpkin patch. On haunted house nights they also have a bonfire. Admission to the haunted house is $10/person. The Farm Market features fresh-picked vegetables as well as black angus beef and smoked meats from animals raised on the farm. They have ice cream, cheese, and other dairy products from other nearby, local farms. They also make and sell their own sauces made from their tomatoes and other vegetables, and carry a line of soy-based fragrances and candles in their souvenir shop"
158 Greenawalt Road, Brookville, PA. Phone: 814-849-2832. Email: mccormack@alltel.net. Directions: From I-80, exit 81 (old exit 14), North on 28 for 1.5 miles, left on Milliron. Go 1 mile to Greenawalt Road. Right on Greenawalt. (second stop sign) The maize is one-half mile on your left. From Brookville at Ace Hardware--Richardsville Road 3.5 miles to Gravel Rd. Follow Gravel Rd. to Milliron. Left on Milliron to Greenawalt. Right on Greenawalt. The Maize is one-half mile on your left. From Hazen, 28 South 3/4 mile to Greenawalt Rd., right on Greenawalt Rd. Watch for signs. Open: from Saturday, September 15th to Saturday, November 3rd, on Thursday and Friday from 6:00 pm to 9:00 pm, Saturday from 1:00 pm to 11:00 pm, Sunday from 1:00 pm to dusk. 2007 Admission prices: Adult 12 and up $7.00, Children 6-11 $5.00, Seniors (65 and over) $5.00, Children 5 and under: Free with adult. Groups/School Field Trips--reservation required . $1 off with College ID. Free with Military ID. Greenawalt Road, Brookville, PA 15825. Phone: 814-849-2832. Email: mccormack@windstream.net. Directions: From I-80, take Exit 81 and go North 1.5 miles to Milliron, turn left. Go to Greenawalt Road, turn right. Cornmaize is on the left about 1/2 mile. And for a map to our farm, click here. Crops are usually available in October. Open: Thursday 6 to 9pm Friday 6 to 11pm Saturday 1 pm to 11pm Sunday 1 pm to dusk. Payment: Cash, only. Haunted Barn October 17, 18, 24, 25, 31 and November 1. 484 Cemetery Road, Falls Creek, PA, 15840. Phone: 814-375-7050. Open April 30 through November 1, Closed in July. They have a corn maze, hay maze, and a couple festivals. The Pumpkin Fests this year are September 30, October 7, 14 and 21, 2006. They are certified under Farmer's Market Nutrition Program..
Old State Road, , PA, Phone: 814-849-4040. October 7, 12, 13, 20, 21, 27, and 28, from 7 to 10PM. Sponsored by: PineCreek Vol. Fire Dept..
1863 Clawson Street, Punxsutawney, PA 15767. Phone: 814-938-2512. Email: traceymahan@yahoo.com. Open: Monday to Sunday 10 am to 6 pm. Directions: From Punxsutawney, take Route 119 North 3 miles. Turn left on Airport Road. Go 1 mile. Make left on Clawson Street. Go 1/4 mile. Farm is on your right. Click here for a map and directions. Pumpkin Patch open September 19, 2009 through October 25, 2009. Payment: Cash, Check. Pumpkin Festival, October 3 and 4, 2009. Featuring Pumpkin Carving Contest and Pumpkin Decorating Contest for all ages. Pumpkin pies, rolls, gobs. Hayrides and kids straw bale maze. Petting Zoo. 147 Kennedy Road, Portersville, PA 16051. Phone: 724-368-3233. Email: Betsy@cheesemanfarm.com. Open: Click here for current open hours, days and dates. Directions: Click here for a map and directions. Payment: Cash, only. We also have a haunted hay ride and a haunted house. 315 Coleman Road, Mcdonald, PA 15057. Phone: 724-926-2541. Email: melanie@bednersgreenhouse.com. Open: Every weekend in October. Click here for current open hours, days and dates. Directions: Take I-79 to the Bridgeville exit. Make a left onto Route 50 west. Follow for about six miles. Look for Coleman-Taylor Funeral Home on the right. Turn right onto Coleman Road. We are one mile down on the right. Click here for a map and directions. Payment: Cash, Check, Debit cards, Visa/MasterCard, Discover, SFMNP Vouchers. Click here for our Facebook page. Main Street, Rt 40, Claysville, PA 15323. Phone: 724-663-5024. Event dates: September 24, 2005, All day; Parade, 12:00noon to 1:00pm. Parade, live entertainment, contests, demonstrations, crafts, raffles, and homemade food. Activities include seed spitting, corn shelling, tallest stalk of corn, longest ear of corn, haybale throwing, biggest sunflower, and longest continuous apple peel. 1 Museum Road, Houston, PA 15342. Phone: 724-228-9256. Email: ptm@pa-trolley.org Open 10/16/04 and 10/17/04 from 10:00 am to 6:00 PM. Ride an orange trolley to the pumpkin patch where children get a pumpkin. Free with regular museum admission. Only October 16-17 & 23-24, 2004, from 10am to 6pm. 170 Simmons Rd, McMurray, PA 15317. Phone: 724-941-1490. Alternate Phone: 724-344-6186. Email: market@simmonsfarm.com. Open: Monday to Saturday 9am to 7pm Sunday 9am to 5pm September 21st to October 31st. Click here for current open hours, days and dates. Pumpkin updates: Click here for updates. Directions: About 20 minutes south of Pittsburgh. Click here for a map and directions. Easter Egg Hunt Early Spring Strawberry Picking Late May to June Flower Picking - Early Summer to Late Fall Peach Picking Late Summer Apple Picking Late Summer to Late Fall Christmas Trees Thanksgiving to Christmas. Payment: Cash, Check, Debit cards, Visa/MasterCard, Discover, SFMNP Vouchers. Click here for our Facebook page. We also have a full service greenhouse at both locations. We do custom planting for homes or business. Also look for us at 12 different farm markets in the south hills and Pittsburgh area. A visitor writes on October 25, 2010: "Hayrides were $8.00 for the ride, and $10.50 for a ride + pumpkin. Everything else was an additional fee - pony rides, apple slingshot, popcorn. There were 2 corn mazes, a 6 acre and a 1 acre. The 6 acre had a game where if you found the punches, you got a free bag of apples. They were pretty well hidden, and nearly impossible to find with kids. The kids lost interest way before you found any of the punches. " Route 136, Eighty Four, PA 15330. Phone: (724) 228-333. Email: springhousefamily@yahoo.com. And for a map to our farm, Click here. And Click here for event updates. Crops are usually available in September, October, December. Open: Monday to Saturday from 9 am to 9 pm and Sunday from 12 pm to 9 pm. Payment: Cash, only. Every Sunday in October we have a Hog Roast and Great Pumpkin Weekends: Bonfires with Hot Dogs & Fixins' (Reservations required). On October 12-14 come for the Houston Pumpkin Festival; we'll have Pumpkin Pie, assorted fruit pies, Apple Dumplins' and all those great SpringHouse goodies that you love! Then on October 19-21 and 27, 28 - Arts & Crafts Christmas Festival Washington County Fair Grounds, We'll have assorted fruit pies, Apple Dumplins' and all those great SpringHouse goodies that you love! On December 8 and 15 we have breakfast with Santa! (Reservations are required). We always have hormone free milk, dairy and much more! Route 88, Finleyville, PA (South of Pittsburgh, near Library, PA). Phone: 412-835-3246. The Fall Harvest Days are held each weekend (Saturday & Sunday 10am to 5PM) from September 18 (in 2004) through the end of October. The pumpkin patch is open Monday-Friday 4pm - 7pm, Saturday & Sunday 9am to 6pm. Hay Rides (weekends, 10 - 5pm, weather permitting): Adults $4, Children 4-12 $3, Children 3 and under free. Corn maze prices: Adults $4, Children 4-12 $3, Children 3 and under FREE. Prices when combined with a hay ride: Adults - $7.50, Children 4-12 - $5.50. Children 3 and under FREE. 306 South Duke Street, Monongahela, PA 15063. Phone: (724) 258-3557. Directions: 15 miles south of Pittsburgh on Rt 51. Monongahola, Pennsylvania. Pitt Maize Quest - 5 acre cornfield maze in the shape of Space Travel. Storybook Pumpkinland -with more than 200 pumpkin-headed, cartoon, storybook, and nursery-rhyme characters. Hay Rides, Fall Flashlight Nights. Live Cornfield Maze. The Big Blue Boo Barn - mildly scary haunted barn with animated characters. Well suited for children ages 5 through 13 and older. Barnyard Animals - watch our goats climb up the Goatfield Bridge. Children's Barnyard Carnival - weekends only. Giant Liberty Tube Slide & Romping Rope Maize - Slide 90 feet from above to underground & Romping Rope Maize. Open in October for the Fall Festival: Monday to Friday 4pm-7pm, Saturday and Sunday 10 am to 6pm. Fall Nightime Fun: (October ONLY) Friday& Saturday, 6pm-10pm . Click here to get directions. And get a discount coupon here! 150 Alder Street, Lower Burrell, PA 15068. Phone: 724-339-2420. Email: betheloffice@verizon.net. Open: October 3 through October 31 Sunday through Friday from 11:30 am to 7:30 pm Saturday 10 am to 9 pm. Directions: Just off of Leechburg Road, behind Rusewicz Funeral Home in Lower Burrell, Pennsylvania. Click here for a map and directions. Pumpkin Patch open October 3 through October 31. Payment: Cash, Check. Click here for our Facebook page. Cornstalks, bows, baked goods available. School groups can reserve a day at our Patch!. 2973 Route 711, Ligoiner, PA 15658. Phone: 724-238-9066. Open: Corn Maze: Every weekend night in October on Friday from 6pm to 11pm; Saturday from 6pm to 11pm and Sunday from 5pm to 9pm. Directions: 1.5 miles south of Ligonier along Route 711. Click here for a map and directions. Payment: Cash, only. Click here for our Facebook page. Near Intersection Of Route 286 And Mamont Road, Murrysville, PA 15668. Phone: 724-327-1706. Email: jhgearhard@aol.com. Directions: 4 miles east, of Cooper's RV Center, on Route 286 (Saltsburg Rd) in Murrysville. Click here for a map and directions. Crops are usually available in September, October. Open: Friday 5pm to 10pm, Saturday 12pm to 10pm, Sunday 12pm to 8pm, After School by appt. Payment: Cash, Check. Horse drawn cart rides. Straw, hay and corn stalks. 1856 Guffy Road, N. Huntingdon, Pa 15642. Phone (724) 863-6930. FAX: (724) 863-4920. Open everyday, from 8:30 am to 8:30 pm (Winter Hours - Weather Permitting) Closed on Christmas and open with limited hours on some of the other holidays. In October we hold our annual Pumpkin Festival. Pumpkins and fall decorations (corn stalks, gourds, hay and straw) are available during regular business hours everyday. Hayrides: Reservations will be accepted starting May 1 for pumpkin season in October. School, church, social, and other groups welcome. As some guests enjoy the ride on the canopied hay wagon which winds through and over the fields for a one-half hour journey, others can enjoy the special Fall amusements; such as, the slide tunnel. Good food, baked goods, and, of course, ice cream are also available in the store. You can eat in the restaurant area or out at the picnic tables. 123 Blue Ribbon Lane, Greensburg, PA 15601. Phone: 724-423-4290. Email: jjohns2@wpa.net. Open: See our website for current hours, Click here for current open hours, days and dates. Directions: Lonesome Valley Farms events are located in Greensburg, Pennsylvania beside Westmoreland Fairgrounds. Click here for a map and directions. Corn Maze and Hayrides are open September 25, 2009 through October 31st; Fridays, Saturdays and Sundays; Non haunted events are open from 6pm to 9pm and the Haunted Events are open from 7:30pm to 10pm; (all events are weather permitting) Other dates by reservation only. Payment: Cash, only. Check the website for "Special Kids Matinee Dates". 1002 Blank Road, Jeannette, PA 15644. Phone: 724-744-7320. Email: schrammfarms@yahoo.com. Directions: From Pittsburgh, take Parkway East to Route 22 through Murrysville. At Watson Chevrolet (on left), make a right onto Mellon Road. At second stop sign, go straight on Harrison City-Export Road. Go approximately 2 miles and arrive at Schramm Farms on your left. Welcome. Open: See our website for festival hours or call us. Click here for current open hours, days and dates. Payment: Cash, Visa/MasterCard. We will also have lots of fun scarecrow displays, pumpkin bowling, a corn kernel play area and teepees!! For more information, see these pages: Fall Fest, Plants, Bakery, Apples, Homegrown Produce, Pictures, Directions. A visitor writes on October 28, 2008: "Great market and bakery. Large selection of fruits and veges. Loved I could purchase golden hubbard squash for pies and brussel sprouts still on the stalk. Fall Fest offers hay rides, pony rides, refreshments. Corn stalks, gourds, hay, pumpkins for sale Market for veges, fruits, plants, flowers, prepared foods. Can order apple trays, fruit baskets and turkeys. 31 different fruits and veges listed with available dates on website "
1856 Guffy Road, North Huntingdon, PA, 15642. Phone: 724-863-6930. Email us at: kerber@kerbers.com. In October we hold our annual Pumpkin Festival. Pumpkins and fall decorations (corn stalks, gourds, hay and straw) are available during regular business hours everyday. Hayrides: Reservations will be accepted starting May 1 for pumpkin season in October. School, church, social, and other groups welcome. Call starting May 1, 2009 to reserve a date. Good food, baked goods, and, of course, ice cream are also available in the store. You can eat in the restaurant area or out at the picnic tables.